Typically the mower deck is either cast aluminum or pressed steel. It is important to maintain it in working order since this houses and acts as protection from the blades, and provides the cut across the lawn, discharging the grass as intended. A regime of maintenance includes cleaning the underside from accumulations. Noticeably in springtime, when the grass is moist and damp, the severed grass blades are likely to clump and layer, hanging on the underside. Thereby reducing the effective volume that is needed in order to cycle the continuous cutting by the rotating blade(s). Usually a non-metal utensil such as a wooden five gallon paint stick is ideal for cleaning this area since it shouldn't scratch the surface and should keep the hands away which is more practical on 21" models rather than for rider mower decks. On larger mowers the deck might have to be pulled or else the mower raised while observing all safety precautions. Many service dealers, when performing pressure washing, only cover the visible topside but rarely is this mentioned to the customer, who almost never sees it. This being the case, the customer might put in a request to clean the underside at a small premium of $20 or less assuming they can do. Inspecting any belts and attention to grease points on pulleys and wheels is almost at no expense, for those doing themselves. Otherwise it's normally done during a service. After the underside has been cleaned, its time to look for signs of rust since these spots are almost always obscured by the dense accumulations of grass. Some service techs will claim that most decks have rust, after the mower has given years of service. But treating the rust is not a customary mower shop service. Alternatives are to send out to a paint shop assuming one can be found with such abilities - however even if one can be found this can swiftly rack a bill up exceeding $200 to $250 dollars for rider decks, or to simply do yourself. Walk behind decks that are rusted, such as with non-self-propelled units, could cost less but assuming a shop minimum is met. Many paint shops make it a policy simply to not treat rust. Cleaning the mower cutting area by pressure washing is close to $35 for rental (although with a half-day/4 hour minimum, other things can be cleaned during the same time, such as concrete floors & walks, to defray the fee). Next, any rust should be removed as much as possible. A wire brush at less than $5 comes in handy but only for limited areas. Heavier, scale rust could call for a mechanized brushing such as a wire wheel ($7 to $20 for the angle grinder wire wheel) along with the cost for eyewear and other protective safety gear assuming that you don't already have these. Once the deck is rid of the removable rust, consider treating it with a solution that converts the rust that is roughly $12 for an 8 ounce bottle, and a disposable brush to apply the solution rather than out of a spray can. Applying two coats of rust inhibitive primer afterward, at close to $9 a quart, and following with rust inhibitive high gloss paint, also near the same price. The total comes in at around $75 to $90 for completing the mower project. 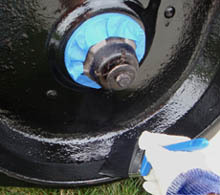 Make certain the paint is fully cured prior to using, and this could take 7 to 10 days or more.